This event will highlight Bisclavret culture in sharing with the city new and exciting variations of whisky, along with natural foods commonly found in the wilds of the Muire. We hope you are impressed to come lounge, splash, and socialize with us at Dunwasser pond. Samples will be given throughout the day, while supplies last, and entertainment will be provided in the form of water games and good company - so bring your swimming clothes! 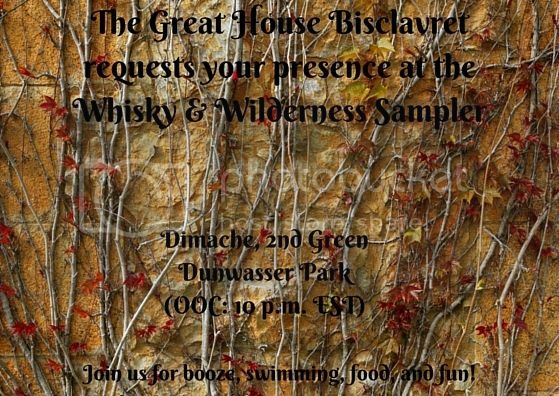 I would like to extend my apologies if anyone thinks any less of House Bisclavret due to my fond shortening of the full name in the closing portion of the invitation; certainly it was not my aim to bring any dishonor upon my family in doing so. Should your opinion of the embassy be impacted by this one word, please write to me so that I may somehow remedy it. This is tomorrow. Please come and join us. Building on the popularity of this event, a second sampler event will be held on Lundi, the first day of Flower in the year of 897 at 7 Late bells (Sun 1st May @ 7 pm EST). A few new foods from the Highlands, included roasted snipe, Caboc and to wash it down Atholl Brose (using Quartermaster Aneira's family recipe!) and of course plenty of whiskey.